When Mary and I started getting serious this spring about our trip to Germany, we naturally tried to think about what to do and see there. Attending Leni’s party was our principle reason, of course, and we knew we had to visit our ancestral home of Bernkastel. Mary had, with the help of Wilfried, gotten tickets to see the saxophone group Sistergold so we were doing that. Beyond that it was open. She had heard of Neuschwantein so she wanted to see that. Cologne was close to where the party was so a trip to the cathedral was pretty easy. While we were there I wanted to see the German-Roman Museum which is right next to the Dom. Munich is where our cousin Andreas lives so we definitely wanted to visit there. 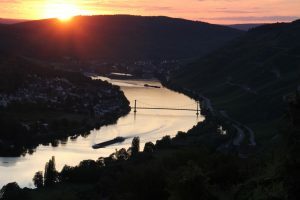 I had fond memories of my honeymoon trip up the Rhine through Freiburg and along the Bodensee. In the end we sort of punted. We knew we would be in Odendorf the first couple of days for the party and we thought we could see how things were and talk to our German relatives about what was practical and interesting in the time we had. Our cousin Mary Sullivan had been to Neuschwanstein the week before we arrived and told us it was expensive and very crowded. She didn’t say don’t go but it certainly put a crimp in the idea. By Sunday, (the party had been Friday night) everyone was heading to their separate homes. Mary and Tom had been in Germany and France already three weeks and were ready to go home. 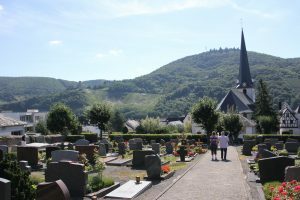 Wilfried packed Mary Beth and I into his car and we headed for Bernkastel. Along the way we discussed plans. 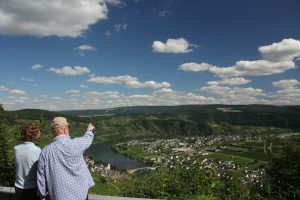 As we neared the Mosel River Valley, he stopped in the village of Klausen hoping for an open restaurant so we could eat lunch. We were either too late or too early for a Sunday, but he had a story about the church there so we stayed and looked around. 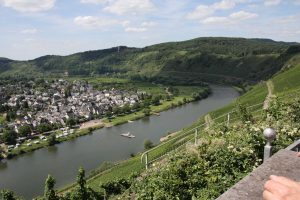 Then we were off again and soon got our first sight of the Mosel. By the time we got to Kues, we were pretty hungry but it was 5 pm and he had already reserved a spot for dinner at 7. We settled for a snack and a beer before getting settled in Leni’s house. 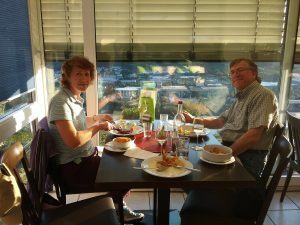 A quick walk around town and a drive up to the Panorama Restaurant in the neighboring village of Graach. After we finished, we tarried to watch the sun go down over the river. The next day in the morning, we walked around Kues and Wilfried showed us the houses our ancestors had lived in at various times in Kues going back over 300 years. Quite amazing for these Californians! This is a view of the church cemetery where many Hangauers are buried. The hills in the background are actually on the other side of the river. If you look carefully, you can see Burg Landshut, also across the river. 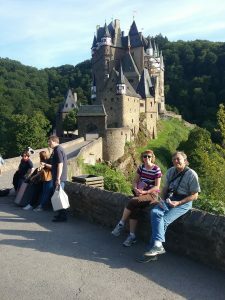 After our walk, we piled into the car and headed out for the only undamaged castle in the valley at Burg Eltz. It survived the French occupation of Napoleon’s time by being hidden in a valley rather than on a hilltop. Despite Wilfried’s GPS, we had a hard time locating it and it was almost 5 pm when we finally got there. It all worked out fine: we still got a tour and a look around before it closed and we had more stories to tell. 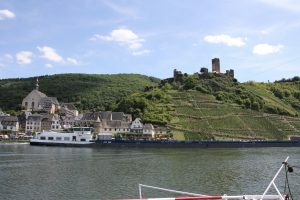 We stopped at Beilstein to take the ferry across the river for lunch under the shadow of Metternich’s birth place. Finally, Burg Eltz (photo by Wilfried). So, the plan that wasn’t a plan worked out great. Speaking for myself, I couldn’t have asked for better traveling companions. 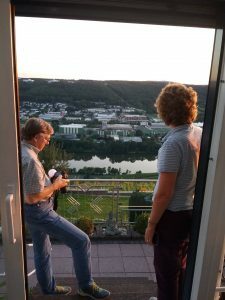 Although Wilfried had seen it all before, he had an easy going approach that allowed us to follow our curiosity perfectly.